Emma and Mark's village hall wedding in Long Clawson, Leicestershire. Emma and Mark’s village hall wedding in Long Clawson, Leicestershire. 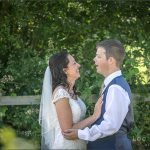 Emma and Mark’s Wedding was exactly as they wanted, in a village hall, in the idyllic Village of Long Clawson in Leicestershire, in the heart of the east midlands, with Coconut Shy’s, ice Cream tricycles and bouncy castles. All they needed was the sun, and boy did it come to make a glorious day! This newly married couple walked from the local Church, to the bunting filled Village Hall, for their wedding party! This couples’ Wedding was about two families coming into one! Their children did them proud, all managing to deliver an emotional speech about their feelings for this day, and it put most of the best man’s speeches, I hear…to shame. Not a google copy and paste in site, just precious thoughts read out at times through tears! As I left this Leicestershire Village Hall Wedding, the wedding party and guests were on the dance floors, the men with their shirt tied around their head, and the ladies with their supplied dancing flip flops! I drove off listening to the Weddings guests having the best party ever!